The appearance of your first line or wrinkle is an important milestone in a woman's life. Most women are understandably keen to prevent them from appearing in the first place or diminish the appearance of already existing lines and wrinkles. You don't need to spend a fortune on expensive anti-wrinkle creams to do this, as making a few simple changes to your lifestyle can be just as effective. This article offers advice on how you can reduce lines and wrinkles. Eating a nutritious diet can help to deal with and reduce wrinkles. There are certain foods that can be beneficial for fighting the ageing process. Foods that are rich in Vitamin C (including citrus fruits) can boost the production of collagen. Foods containing Vitamin E can fight ageing free radicals. Salmon (and other types of oily fish) contain omega-3 fatty acids that can help to plump up the skin to reduce wrinkles and lines. Fruit and vegetables contain antioxidants to fight free radicals. Exposing your skin to direct sunlight without using adequate sun protection can age your skin dramatically. Damage can occur even on cloudy days, so you should always wear sun protection when you are outdoors. It is no coincidence that regular smokers tend to have more lines and wrinkles than non-smokers. Smoking is one of the worst culprits for premature ageing, along with regular exposure to the sun. As well as having more lines and wrinkles than those who don't smoke, smokers are also more prone to developing deep set lines and wrinkles that no amount of expensive anti-wrinkle cream or lifestyle changes will reduce. Using a cleanser is a better option than using a facial wash, as it strips less natural oils from your face. 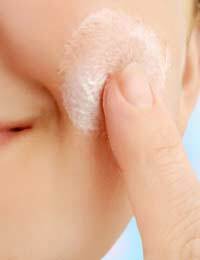 Dry skin will generally age more than oily skins because of the lack of natural oil in comparison. When using cleanser, sweep it onto your face and remove in upward motions (as will usually be indicated on the packaging). There are some effective anti-wrinkle creams and lotions, but many simply cover up lines and wrinkles using clever tricks such as light reflection to draw the eye away from them. In other words, they do little to actually reduce wrinkles and fine lines. This is fine if you have deep set wrinkles that probably cannot be substantially reduced, but changing your lifestyle will often be far more effective at diminishing the appearance of fine lines and wrinkles. If you do opt for an anti-wrinkle cream, look for one containing retinol (an antioxidant), Alpha Hydroxy Acids (AHAs) (which help to remove old and dead skin so that new skin can come through in its place, thus contributing to a fresh-looking complexion), coenzyme Q10 (which regulates cell energy production) and copper peptides (which stimulates collagen production).